1. Dream it; 2. determine your needs and assign physical space requirements to each element; 3. define your style. I pictured a low water landscape breathing peace and beauty, brimming with color and plant life. 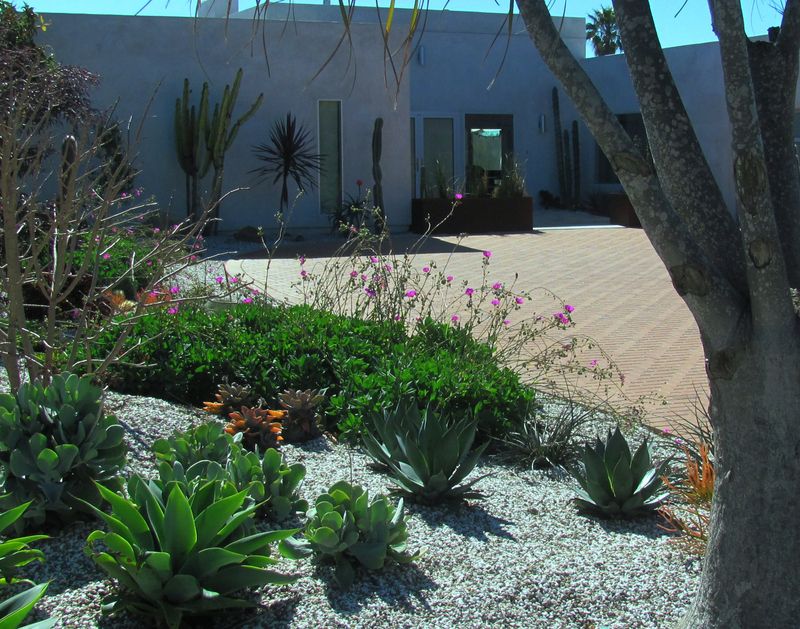 The garden would be laid out around two main paved areas reminiscent of Spanish/Mexican courtyards. 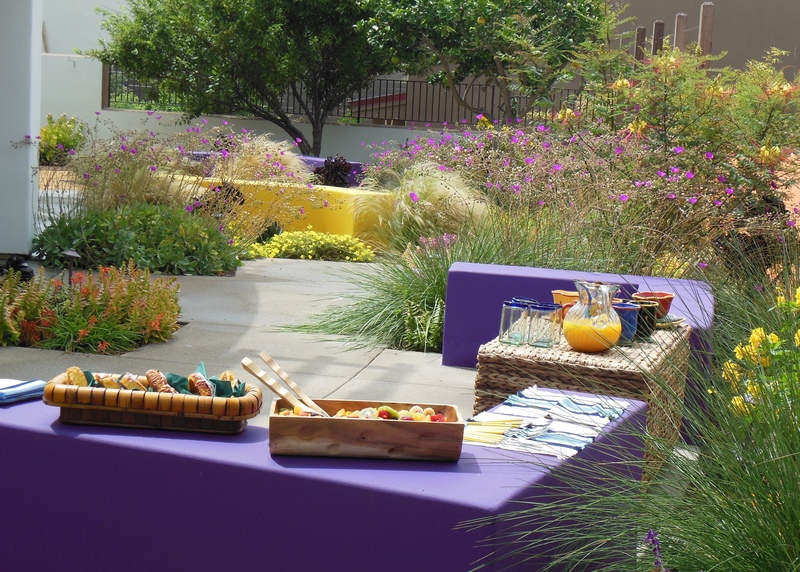 Benches would offer seating to take a drink or finger food, to enjoy the many colors or to feel the comfortable atmosphere and peaceful mood of the garden. The other area, closest to Rachel’s kitchen, would be the main food serving area. Here two benches would form a square for people to mingle, with room for side tables that Rachel could bring in if she had more trays than she wanted to place directly on the benches. A walkway would be connecting these spaces, and their layout would be following the shape of the house (its walls were slightly curved outwards); the new pavement would be placed directly adjacent to the existing patio to allow people comfortable access to all areas of the garden. 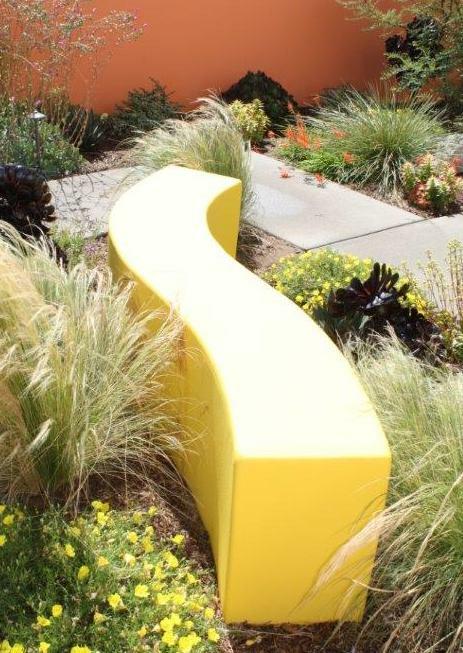 The benches would allow me to introduce more colors into the garden: They would be in complementary colors to each other, to the perimeter walls that I’d also paint, and to an additional, purely ornamental wall that I would use as “room divider”, “weight” and upright element in the garden. This wall, in the shape of an undulating wave, would complement and contrast a water feature that would be the focal point of the quieter sitting area. Rachel was very excited about the first draft of this backyard landscape design and approved all of it. She was most thrilled about the idea of applying paint to all of the walls, the perimeter wall included. And she loved the fountain idea which consisted of two stone slabs, mounted one on top of the other at differing angles, with a central core from which water would run over both stones. And so the final design came together very quickly. 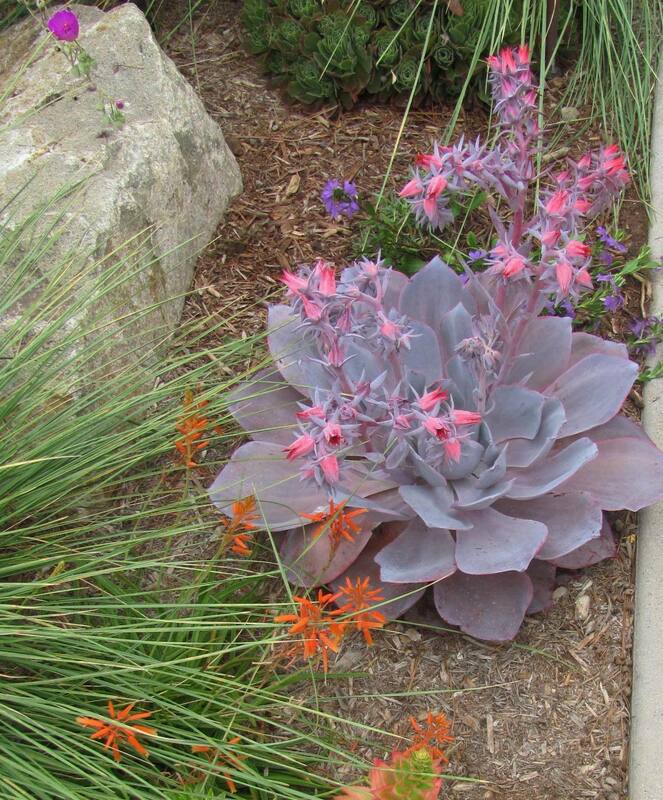 After a soil test we chose a mix of some “Southwestern” plants with some other ones that like it here in Leucadia, too: Rock Purslane Calandrinia spectabilis, Aloe ‘Red Hot Chili Pepper’, Red Yucca Hesperaloe parviflora, Aeonium ‘Cabernet’ and Crassula ‘Campfire, to name a few’; more drought resistant plants such as Sundrops Calylophus drummondii and Penstemon Margarita BoP; the “bones” and structure of this low water landscape would be provided by the shrubs ‘Goldstar’ Yellow Bells Tecoma stans stans ‘Goldstar’ and Dwarf Variegated Myrtle Myrtus communis variegata compacta, to which Rachel added a favorite of hers, a Yellow Mexican Bird of Paradise Caesalpinia gilliesii. We placed another shade tree to shade the reading nook (Crape Myrtle “Centennial Spirit” Lagerstroemia x hybrids), over at the other end of the garden; its orange-red color will be a nice color teaser when in bloom. Ornamental grasses add a light and airy, even dreamy character to the plantings. 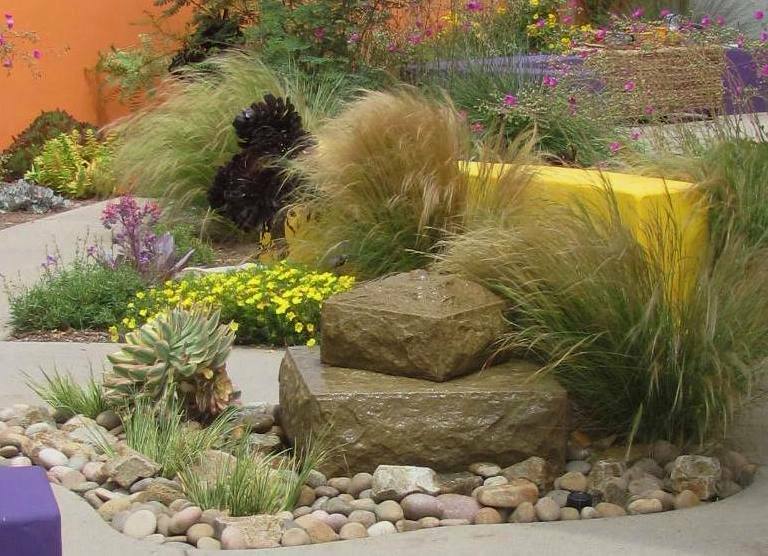 Here we used Hairy Awn Mulhly Muhlenbergia capillaris, Golden Variegated Sweet Flag Acorus gramineus ‘Ogon’, and Blue Oat Grass Helictotrichon sempervirens. 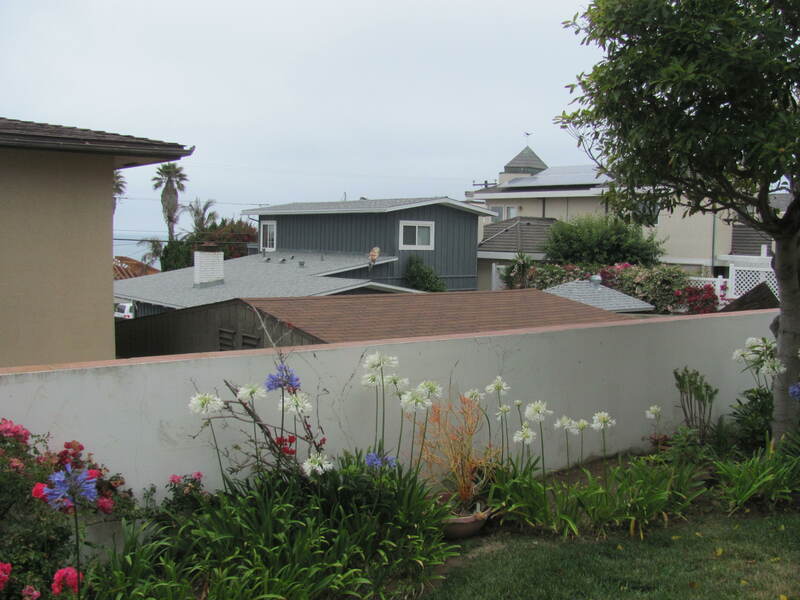 Purple Bougainvilleas drape a post-and-wire-trellis in two critical places to raise the privacy screen around the perimeter but leave a window to view the ocean. 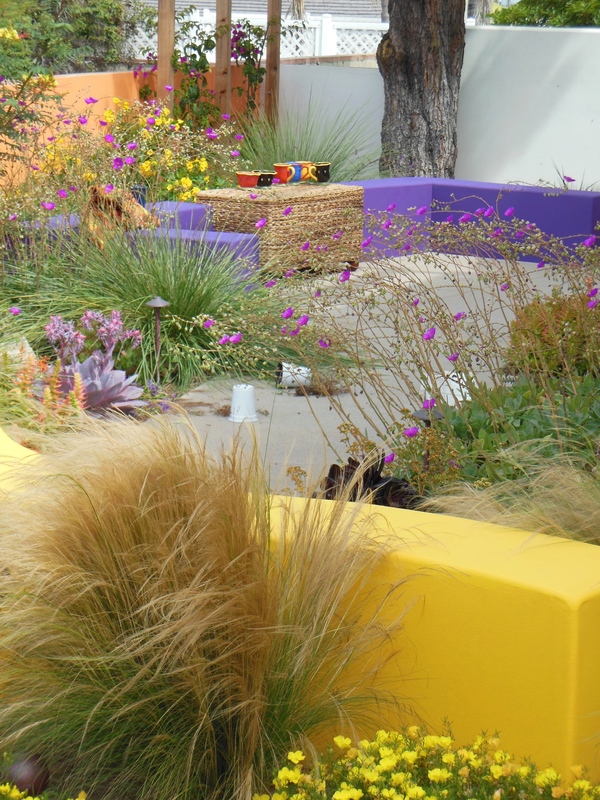 To the colors of the plants those of the walls would be a permanent contrast, stimulus and harmonious “compliment” . 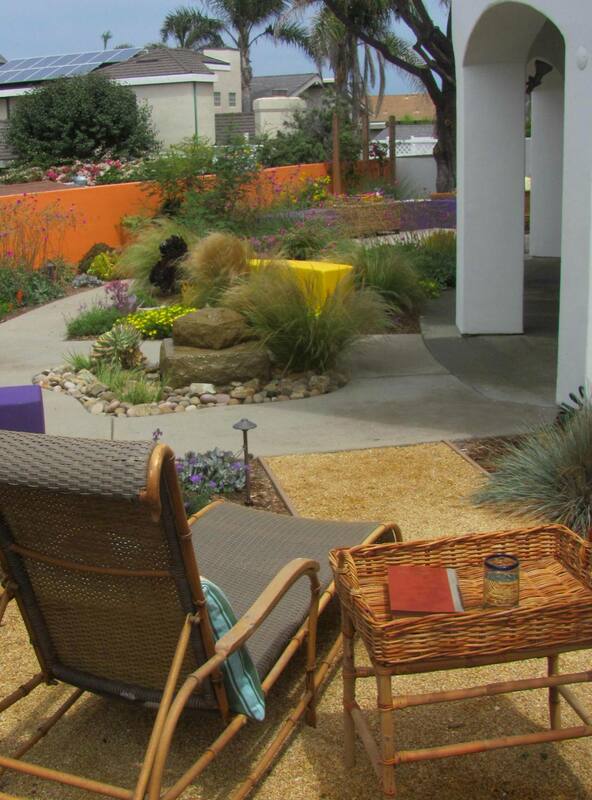 We chose Orange for the perimeter wall; “Violet Majesty” purple for the seatwalls; and Chartreuse/lime for the curved wall across from the fountain. 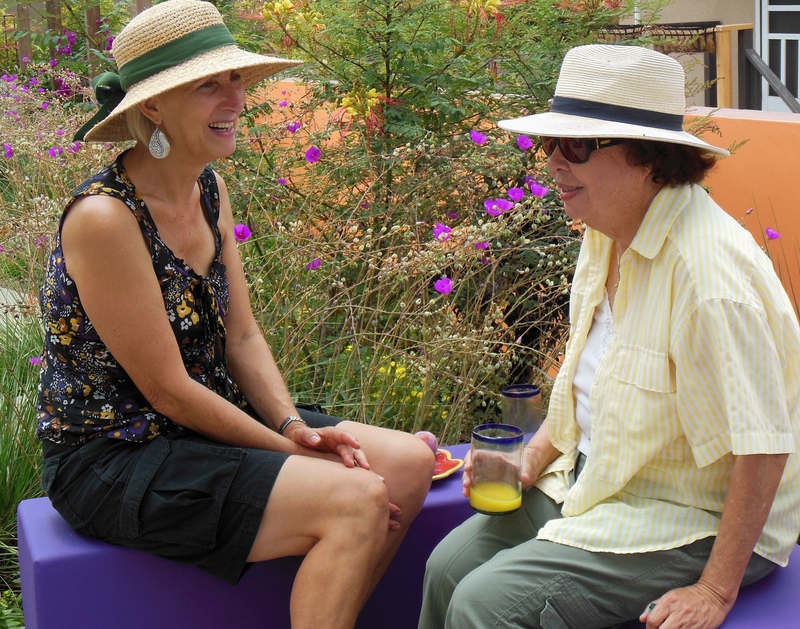 Sitting in the sun with Rachel recently on one of the colorful benches, and enjoying a sweet breakfast Danish (a “prop” left-over from staging her garden for the photo shoot), she remarked on how much she loves her garden now, and how she marvels at discovering, every morning when she comes outside to visit it, another plant in bloom or just colorful on its own. 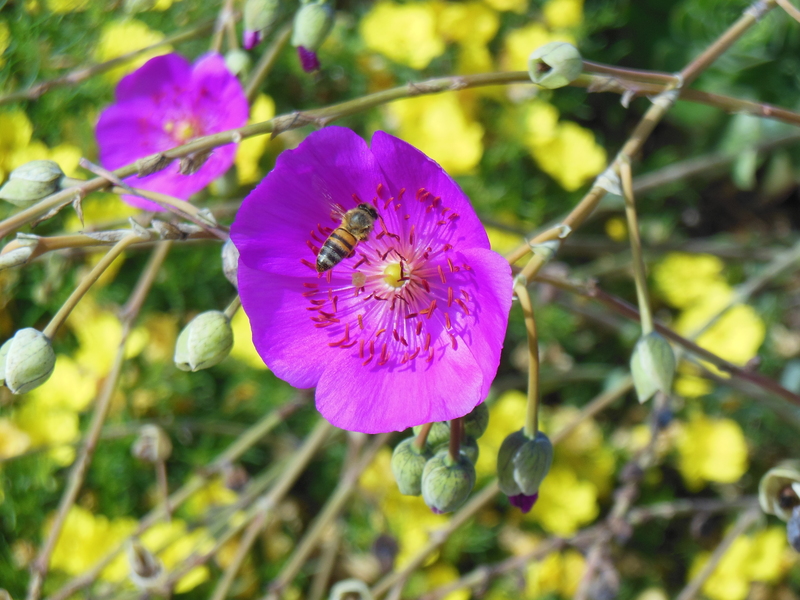 At that moment a bee was visiting a rock purslane flower right behind her shoulder, and as I was pointing the bee out to her she hardly moved away and said she loved how so many of them are now visiting her garden. This is what she had dreamt of, and she’s learning to take care of the plants and delight in them any moment she can. 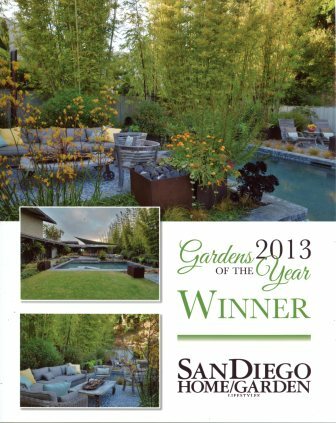 This backyard landscape design was faithfully executed by San Diego Landscaper Mark Sterk/Columbine Landscape Inc.
Everything about the location of their new home appealed to Ara and Diego: Conveniently located at a comfortable driving distance to schools, work (both work in medical research at a local university), shopping and cultural events of San Diego, and located in a quiet residential neighborhood, it offered a magnificent view of San Diego Bay, right from their back patio. 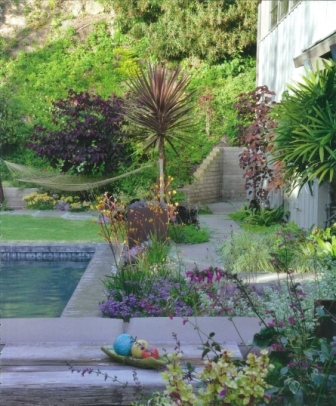 It had a good-sized landscape with many fruit trees and room for Diego’s exotics collection; it even had a pool and large play lawns for the couple’s three children. The home’s architecture and layout however left a lot to be desired: The 70’s style red tile roof of this Perceived-Spanish fantasy weighed heavily on it; chopped-up rooms and lack of windows and doors were not taking advantage of one of the most prized attributes to Southern California lifestyle: Our brilliant skies and mild temperatures inviting “inside-out living” spaces that blend seamlessly together. Ara and Diego dreamt of taking advantage of all as much as possible; with their love of contemporary and mid-century modern art and architecture they decided on a radical transformation of their new home. The changes would not stop at the home itself; picket fence, spindly palm trees and neatly hedged shrubs did not fit into their aesthetics either nor into their sense of sustainability. One of the first things they decided on was to lift off the heavy roof, revealing the clean horizontal lines of a modernist bungalow, and refreshing the exterior with a white smooth “Santa Barbara” stucco. On the inside, rooms were enlarged, and in the center a large community space created that floats seamlessly from living to dining to living space. The old entry hall was removed and replaced by a courtyard that is open to the front yard; a room addition created a U-shaped patio in the back yard. Here a warm, barefoot-friendly Ipe deck is a continuation of the wood flooring indoors and invites as much living outdoors as possible, facilitated by sliding doors that connect every room with the outside. 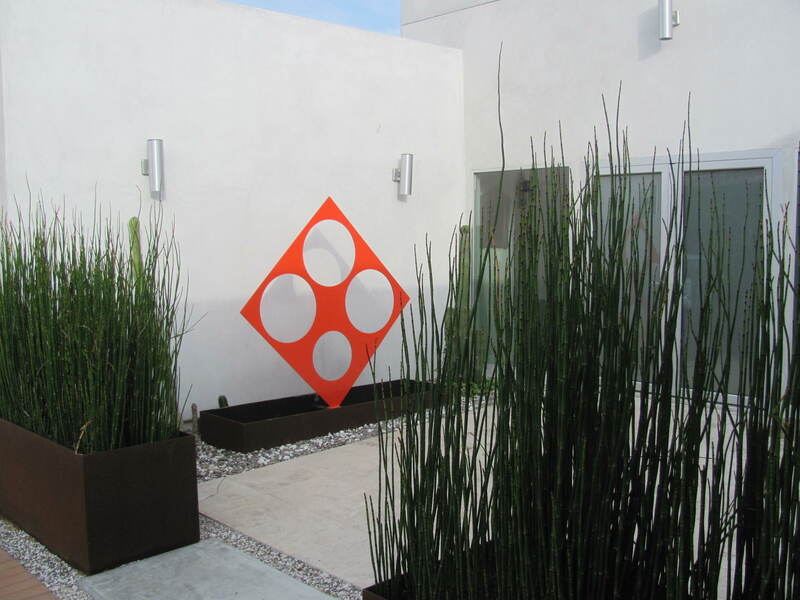 Ara’s and Diego’s creative passions didn’t stop at the house : They were interested in landscape design help that would complement and soften the crisp edges of the home’s modernist design; it needed also to reflect the couple’s artwork and accommodate their active lifestyle. 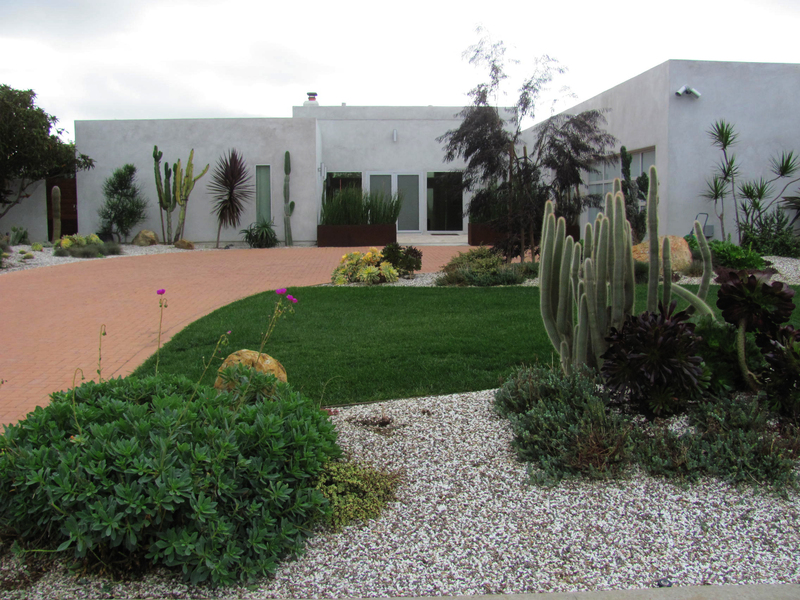 The new landscape design should work with the dry California climate as a low water landscape; it should only require a modicum of maintenance, and it also needed to incorporate Diego’s exotic collection of cacti and succulents. 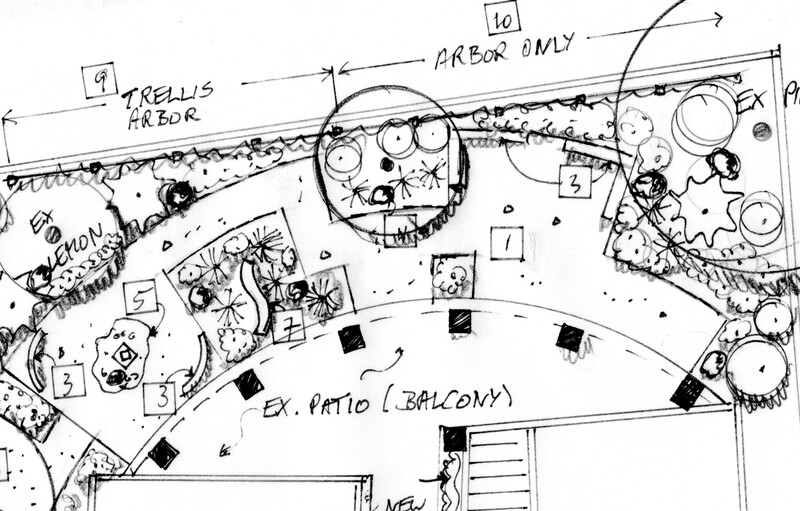 As we were brainstorming possible landscape design ideas, we agreed that the lawns had an essential place in the landscape as much-used play areas for the couple’s children and their friends. 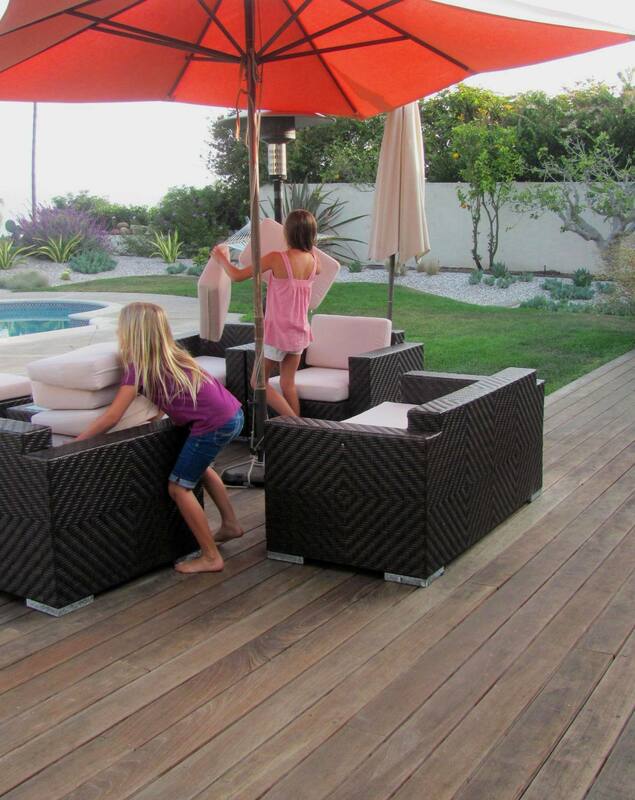 Both the back yard landscape design as well as the front yard are designed around the children’s activities. The entrance patio, right next to the garage and the driveway, was a bit too open to the public; we wanted it to be off-set without employing a heavy screen. The pavement here consisted of a beautiful travertine tile into which we cut out a row of tiles, just between it and the driveway. 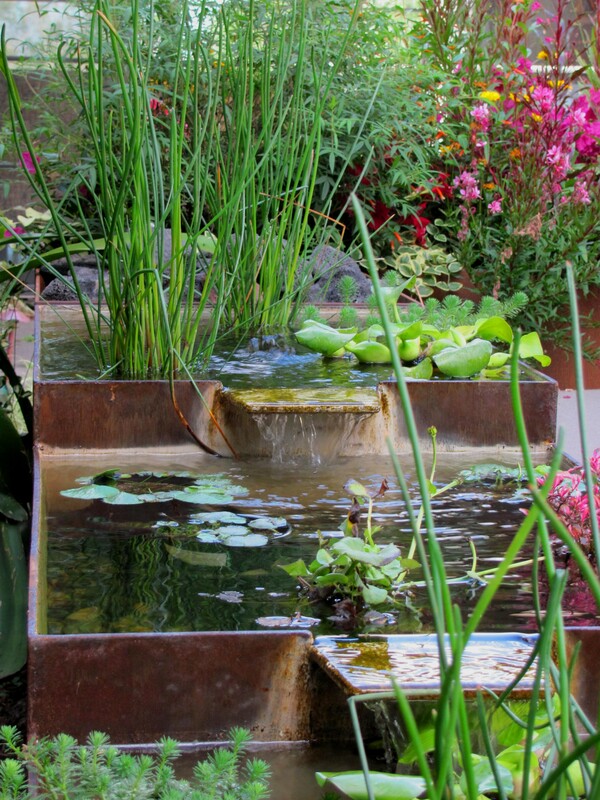 Here we placed a couple of naturally rusted steel troughs that “enclosed” the patio and created a visual although very low separation between the two. More a suggestion rather than an actual screen, a lacy curtain of horsetail reeds creates greater privacy for this courtyard that is open to the public yet can’t easily be scrutinized by passersby. With the heavy roofs gone, the horizontal lines of the architecture dominated the landscape. 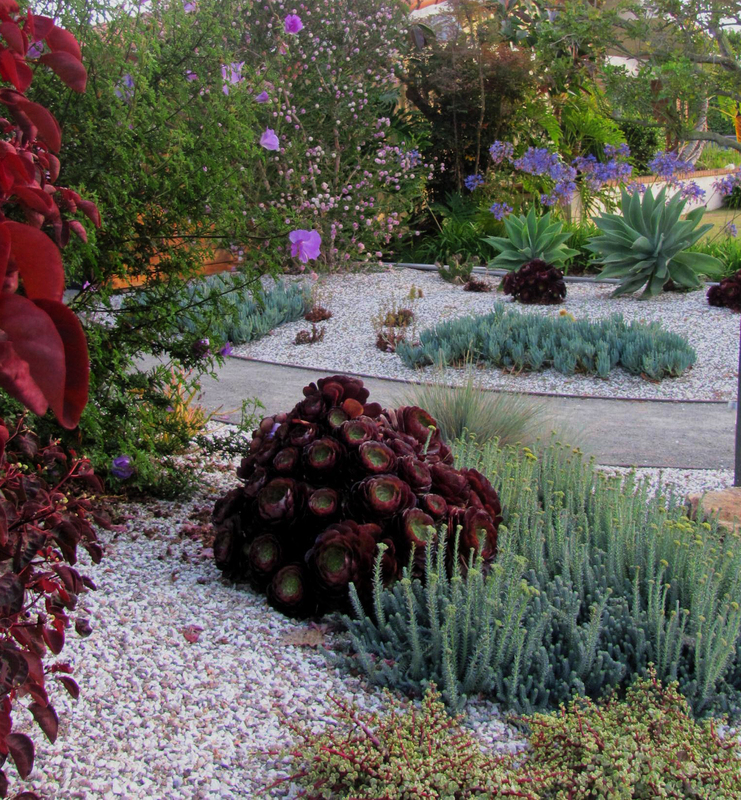 I employed xeriscape plants whose dramatic shapes, intricate textures and sky-reaching forms contrast with the regularity of the architecture and lend an exotic touch to the landscape: Dracaenas Dracaena marginata, Ponytail Palm Beaucarnea recurvata, Caribbean Copper Plant Euphorbia cotinifolia and Purple Peppermint Willow Agonis flexuosa ‘After Dark’ lend the height and the dark color accent; Agaves and cacti the exotic notes; bold Aeoniums and Rock Purslane Calandrinia spectabilis the color and visual interest. 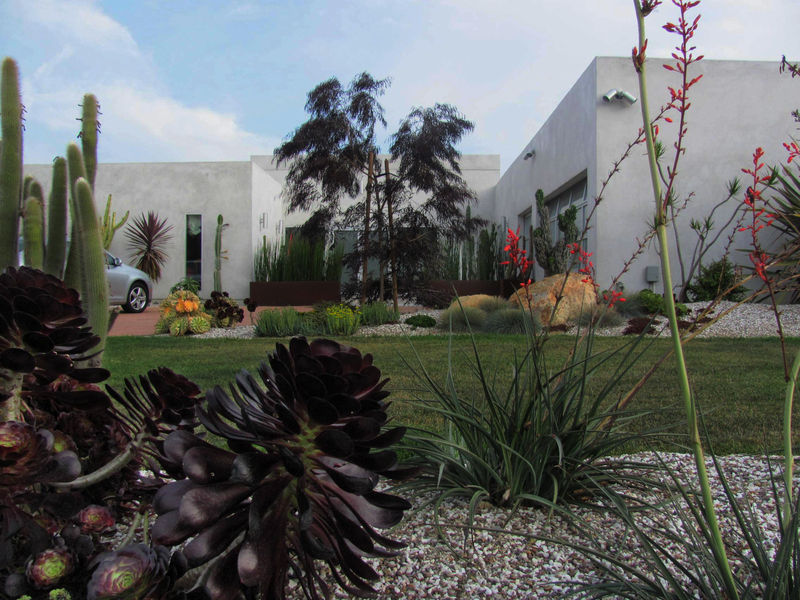 A giant New Zealand Flax, Rushes and False Yucca Hesperaloe parviflora lend the airier character, and to all xeriphytic perennials contribute a softening effect. The old access to the side yard was re-designed; a good-looking Ipe fence picks up the material used in the back yard for the deck extension and inside the home for the flooring. 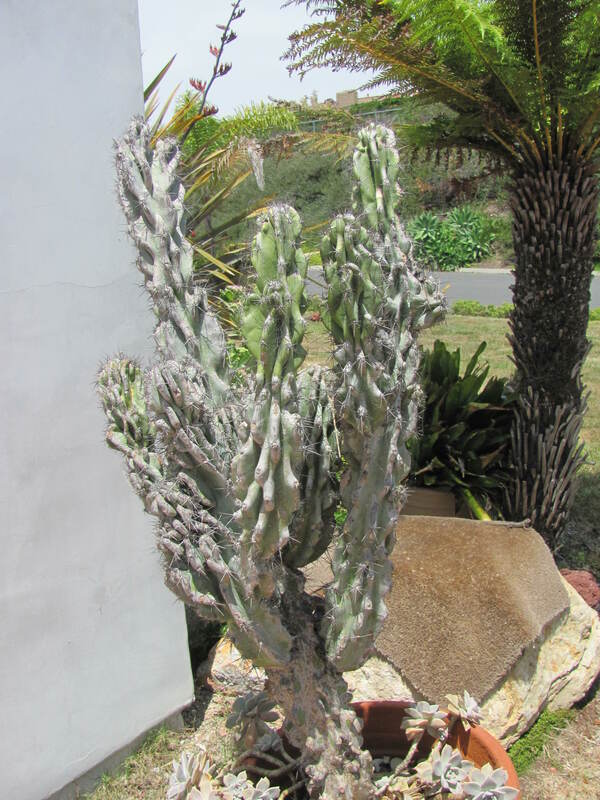 Diego had already started a substantial collection of fantastic cacti such as Cleistocactus and Cereus monstrosus; also Foxtail Agaves, Aloes and a giant Euphorbia canariensis; some of them had been salvaged from his previous home. 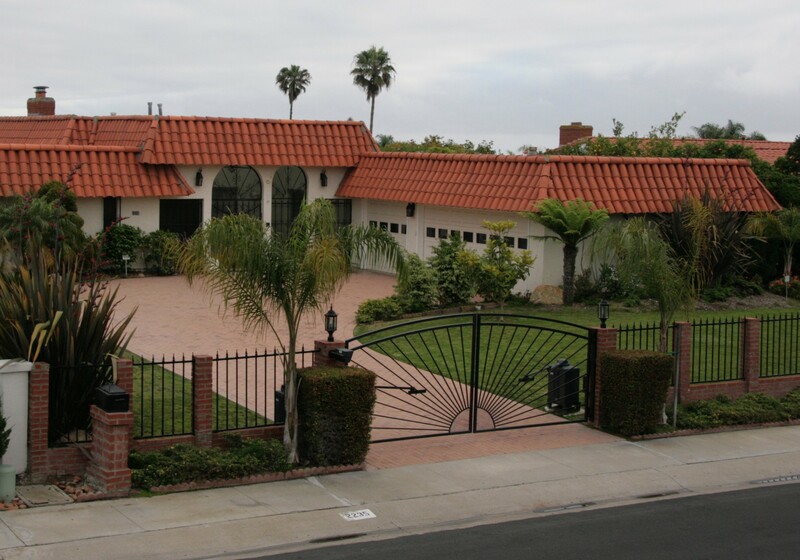 They all found their new home in this xeriscape San Diego and are a much better aesthetical fit for the home’s architectural style than the clipped shrubs and fence of the former landscape. Some of them act as their own dramatic pieces of art and have prominent places in the landscape (here across from the red metal courtyard sculpture). 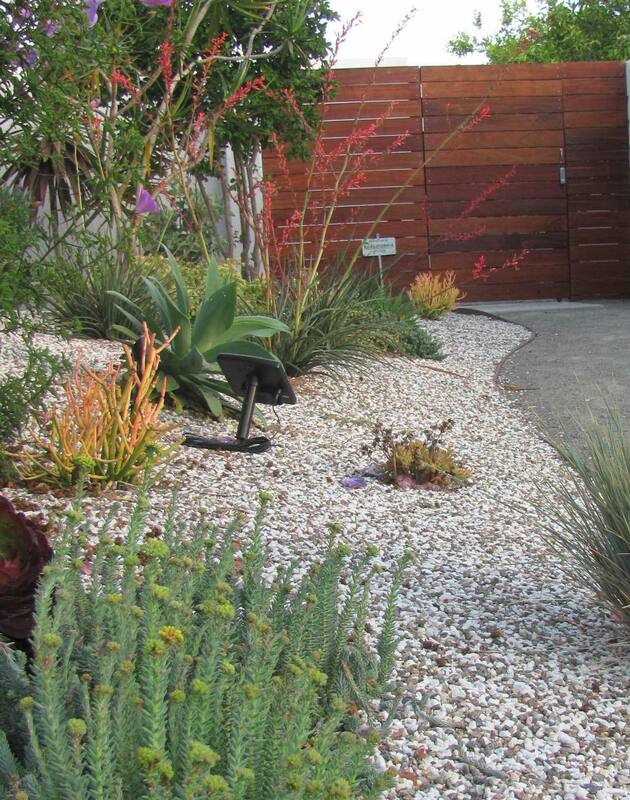 A local gravel called ‘Palm Springs Gold’ serves as mulch and adds a textural element. It is also a clean foil against which the colors and textures of these plants stand out. 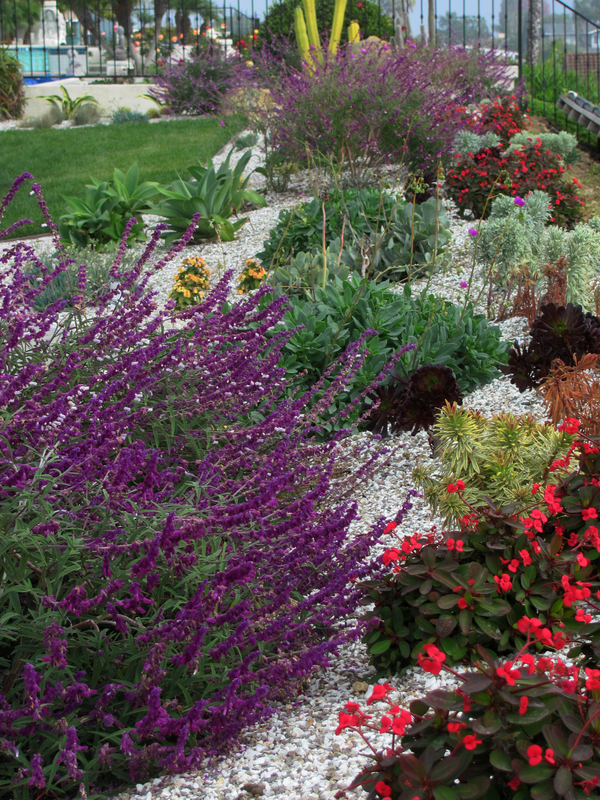 It evokes a desert scape in which succulents are used in great numbers together with long-flowering and lasting perennials and other drought resistant plants. 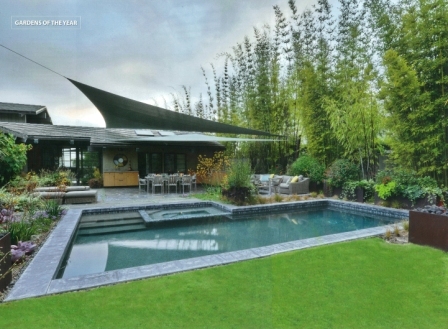 More from common sense and the desire for sustainability than aesthetics, the existing pool and part of the previous deck (bordering the new Ipe deck) were integrated into the new landscape and allow a smooth access from house to pool, play lawn and garden. When the weather is warm which is around 300 days a year, the family keeps the windows and sliding doors to this terrace open. What an exciting project this was, and how satisfying. 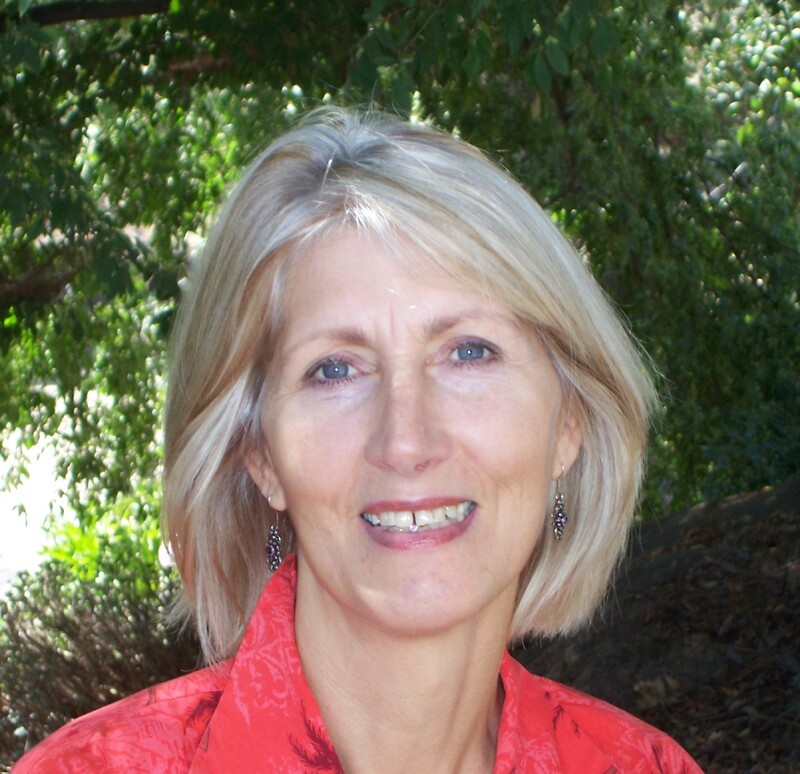 To me as landscape designer San Diego it reflects a new “California Mix”: A definite aesthetic sense influencing the design of home and garden without ever imposing a purist’s approach; a strong desire for a sustainable landscape design that honors the style of the owners while acknowledging the needs of the family and the environment.